I’m sitting in a library … Which feels appropriate, because I want to write my first review in some considerable time … And it involves libraries. 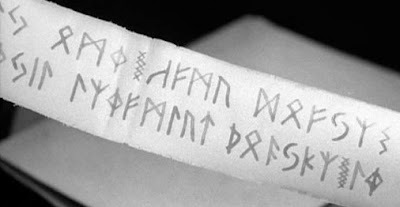 M. R. James’ story Casting the Runes is about the power of the written word and about the mortal dangers of writing a scathing review. Well, it’s a shockingly poor piece of work, Monty; you should be ashamed of yourself! Nothing in the trees? Nothing coming? Phew. Actually, Casting The Runes is one of the key texts of English horror fiction, featuring the malicious occultist, Karswell who, despite being almost entirely absent from the narrative, strikes me as one of the most malignant antagonists in horror literature. I have just this evening seen a magnificent theatrical rendering of Casting The Runes, which is why I have felt moved (after all this time) to put finger to keyboard (and take my life, therefore, in my hands) by reviewing it. The story is simple: An ‘alchemist’ called Karswell desires to be taken seriously. To that end, he has written an academic paper, ‘The Truth of Alchemy’, which has been roundly rejected on the grounds that it is ‘nonsense’. The person who made this judgement is one Edward Dunning and he, to his cost, will learn that Karswell is a vengeful man. The story follows Dunning as he becomes gradually aware of then eventually mortally afeared of Karswell. Imagine the repercussions of telling Hannibal Lecter you didn’t like his foie gras and you get the idea. He learns that Karswell has cursed him, by passing him a slip of paper with a spell written on it. His only way to save his own life is to conspire to get Karswell to take it back, but he isn’t going to do that willingly. Now, if this sounds at all familiar, that may well be because you are thinking of the film Night of the Demon (1957), known by some (wrongly) as Curse of the Demon, which is a movie adaptation of the story. So, what does this have to do with libraries? Well, in the original story and in the film version and, indeed, in the theatrical rendering I saw this evening, the curse is passed over to Dunning in a library. All three versions are very different in feel and approach, but all three are equally involving. James’ original has his trademark mannered and loquacious style, as befitting an antiquarian. The film has that polite, faintly embarrassed air that all British genre films of the period carry, but still makes the most of its American (and therefore exotic) lead, and manages to be pacy and chilling. As hokey as that demon may look to 21st century eyes, the way it is lit and shot means it remains disturbing, especially because of the remarkable insectoid sound effect they use to accompany it. I can think of nothing to match in in British 50s cinema. No, not even Quatermass. So, why am I mentioning all this? Well, I’m glad you asked. I’m attending a conference on ‘Weird Fiction’ at Loughborough University and the first day culminated in a performance by the theatrical company Boxtale Soup. I’ve never seen them before, never even heard of them but, based on what I witnessed tonight; I can’t wait for my next chance to do so. Their version of Casting the Runes is very simply staged. There are just the two of them, arriving on stage with suitcases which contain their costumes and are consequently employed as pretty much everything they’ll need. These, I imagine, are the boxes containing the tales. The mise en scene is deceptively simple, the set and props are made from cardboard, in shades of grey and brown. The costumes are black and white, with highlights of newsprint and the odd splash of crimson. One could even say slash of crimson. Noel Byrne plays Dunning with an easy confident air that slowly erodes as he realises the seriousness of the trap in which he is caught. Antonia Christophers plays everyone else, swapping convincingly from character to character with a simple change of a skirt or a scarf, accompanied by a different accent and a different demeanour. I won’t tell you how they depict the devilish Karswell, because that delight is especially effective if seen unspoiled. It's important that Byrne stay in character because, as the focus of unseen malevolent forces, it helps the drama for us to experience his slowly fermenting fear with him. The performances are naturalistic, even intimate (especially if seen in a small performance space) from the moment the actors take the stage and patiently put on their costumes. I particularly like the way Byrne assumes the mantle of Dunning by pulling his tie taught with a resigned sigh. I feel like that when I put a tie on. However, the tie in question, being decorated with text, is a fine thing. I’d wear that tie. They should sell them as merchandise! So cocky is Dunning, in a delightfully meta-textual moment, he debunks his own tormentor to his students, exposing some of the stage-craft they have themselves used. He dismisses the use of fishing wire and magnets to create so-called ‘magical’ effects, and then the production makes careful and clever use of these tricks to create its own effects. But this show isn’t about the effects, it’s about the people. The scene transitions are achieved through musical segues played and sung by the two performers (which typically evoke The Rime of the Ancient Mariner, a text about breaking a curse, referenced in the original story) while Christophers makes quick and simple costume changes and Byrne moves the suitcases around to form the next setting. All very simple and effective. Because the actors never leave the stage, and even make eye contact with the audience from time to time, I found myself becoming more and more emotionally involved with them. Empathy and identification are key tools in creating horror and this works especially well when you feel a connection with the actors as well as the characters. There is a palpable and building tension here, which is made all the more pleasantly surprising given the relatively short running time of the play (just under an hour) and the lack of theatrical artifice. I was put in mind of Jeremy Dyson and Andy Nyman’s Ghost Stories, which I saw last year. That had all the heft of a full West End production, involving lighting and sound effects, moving sets and a sizeable cast (not to mention the involvement of Derren Brown’s creative collaborator) to produce an undeniably creepy and clever show. But at £50 a seat – it bloody well better be effective! This production, with the barest of sets and the simplest of effects, is every bit as dread-full (in a good way!) This demonstrates a great understanding not only of the source material but also of the stagecraft needed to bring it to life in a very different medium. The attention to detail in the production is magnificent, from the confident script they wrote themselves, to the folky music they composed (with possibly a deliberate nod to The Wicker Man), to the cunningly-constructed hand-built props and, of course, to the subtle and careful performances. I should be head-first in a book right now, preparing for some more weirdness tomorrow, but I’m not, I’m sitting in this library casting my own runes, because I feel that these performers deserve my response. This is a clever, cunning, elegantly simple production that doesn’t let the stagecraft get between the audience and the drama. Sitting in the front row, I felt exposed; in harm’s way. What more can one ask of a horror story? Boxtale Soup’s website is here. They are a charity and deserving of your time ad consideration. And I want to buy one of those ties, guys! Everything you could ever want to know about the Loughborough Uni Weekend of Weird (which I will henceforth refer to as "WoW", by the way) is available here. If you want to know more about Night of the Demon (and if you think you don’t, you’re wrong) then may I point you in the direction of the book Beating The Devil by the film industry’s second favourite Yorkshireman*: Tony Earnshaw. Learn more about it and him here. If you'd like to know more about the original story, you can do so at the click of a mouse. There are various audio-book versions of the story available but this is, I feel, a particularly good one. We'll forgive Mr. French for being an American whilst reading something quintessentially English, since he has such and excellent voice. And now, a bit of fun. If that phrase from the film ‘It’s in the trees, it’s coming’ rings a bell … Here’s why. *Sean Bean, alright? I’m sorry, but them’s the rules. Hey look – Sean Bean made it to the end of something … Namely, this blog.